“This year is a unique opportunity for our generation to set clear goals and clear pathways to a safer, better, more prosperous world,” says economist Jeffrey Sachs, who is Special Adviser to the United Nations Secretary-General on the Millennium Development Goals (MDGs), a set of global anti-poverty targets that were supposed to be achieved by 2015. In an interview with the UN News Centre, the internationally renowned development expert explains why it is urgent for the world to change direction and embark on a more sustainable path, what he hopes countries will achieve during this critical year, and what it will take to truly end poverty – which he stresses is not just an economic challenge but a moral one. The interview has been edited for content and clarity. UN News Centre: The UN has dubbed 2015 the time for global action for people and the planet. Why is this year so crucial? Jeffrey Sachs: This is the big year for sustainable development. It’s happened for various diplomatic reasons that everything’s converging in 2015. We have of course the adoption of the sustainable development goals (SDGs) in September 2015. That was a decision taken back in 2012 at the 20th anniversary of the Rio Earth Summit – that we would have SDGs. With the Millennium Development Goals ending, the new sustainable development goals will be adopted in September. Then, because of the setbacks in Copenhagen way back in 2009 on the climate negotiations, a new timetable was set to reach a good, solid agreement, and it was decided that that would be December 2015 – same year, almost back-to-back with the sustainable development goals. So the world heads to COP21 – the 21st Conference of the Parties – in Paris in late November, early December. Then countries said, well if we’re going to implement all of this, how are we going to paying for it? We need financing for sustainable development. And a third high-level meeting was put on the agenda in Addis Ababa in July – the Conference on Financing for Development. Well that’s an amazing line-up – July, September, December – that gives us a chance to change direction in the world to adopt sustainable development as a true operating principle for the planet. It’s urgent that we change direction and this year is a unique opportunity for our generation to set clear goals and clear pathways to a safer, better, more prosperous world. UN News Centre: With so many important issues on the global agenda this year, what is the one thing, in your view, that governments must achieve in 2015? Jeffrey Sachs: Governments have to achieve a new vision – that is the vision of sustainable development, which means combining economic development, social inclusion and environmental sustainability. That’s the concept that can keep us safe, that can be a path to fairness in the world, and a path to prosperity. So by taking that holistic vision and putting it front and centre, whether it’s for finance, whether it’s for new goals or whether it’s for climate, we can have success. UN News Centre: How would you assess the Millennium Development Goals, which have been the blueprint for the global community for the past 15 years? Jeffrey Sachs: I think the Millennium Development Goals have shown that goals matter. When they were announced in September 2000, there was a lot of skepticism. In fact, I’m sure that some leaders didn’t even realize they had adopted goals when they adopted the Millennium Declaration… But now we see no cause for cynicism. The MDGs found a foothold. They helped countries all over the world to focus… that our highest priority is the life and death struggle of poor people, to help them, not only to survive but to get out of extreme poverty. And while they didn’t achieve all that we could have achieved, and all that we said we would achieve, they did spur a lot of progress. So much so that in 2012, when governments were reviewing sustainable development, they said ‘Hmm, our treaties aren’t working as well as they need to but look at those Millennium Development Goals, they’re not even treaties but they’re having a big public effect.’ So that was one of the motivations for having sustainable development goals… the progress that was being achieved under the Millennium Development Goals. Now one could also point out [that] we could have done more… should have done more. The promises for example of reaching 0.7 [per cent of gross national income for official development assistance] or making better efforts to 0.7 by the rich countries… mostly did not materialize… But even with the financial crisis, even with the failure of follow through in some areas, when you think about the progress on fighting AIDS, the progress on fighting malaria, TB, the children in school, the reductions of maternal mortality rates, the more people that have access to safe water, and of course, the overall triumph that if you look at the developing countries as a whole, poverty has been more than halved in its rate, comparing 1990 till today, one can take a lot of satisfaction and have the sense that goals matter. Let’s get on to good, strong sustainable development goals, of which SDG 1 will be finish the job of the MDGs. Let’s end extreme poverty by the year 2030. UN News Centre: Do you think it’s possible to eradicate poverty in our lifetime and if so, what will it take? Jeffrey Sachs: Of course it’s possible to eradicate poverty when you realize how rich this world is. For well under 1 per cent of the income of the rich countries, we could finish the job of ending extreme poverty. The challenge of course is partly economic, partly technological, but fundamentally moral. It’s a matter of mobilizing the will and the commitment to follow through on expanding access to health care and expanding access to education; on helping smallholder farmers to be more productive; on giving skills and training to young people in the rapidly growing urban areas of low-income countries; of making sure that there is wireless broadband that can really be a great platform for new jobs, new applications, new industries, new outreach, new governance. For well under 1 per cent of the income of the rich countries, we could finish the job of ending extreme poverty. The challenge of course is partly economic, partly technological, but fundamentally moral. Yes, of course we can do it. And it wouldn’t take much. It would basically take our attention. That I find to be the real limiting factor. We’re distracted. We’re easily thrown off course. We’re fighting emergencies sometimes that aren’t real emergencies, but not looking at what we really could do over the medium term. If we set our eyes firmly on 2030 and say by then we end extreme poverty, this can be done.UN News Centre: You’ve said that sustainable development is “the greatest, most complicated challenge humanity has ever faced.” Can you explain? Jeffrey Sachs: We have, at the core, a kind of collision course that we didn’t expect. And that is that the world economy is growing, and I’d say growing rather robustly though perhaps not as strong and not as universally as we would like. But the planet itself is not growing. You have an expanding world population, an expanding world economy on a finite planet. What we have seen therefore, what the scientists are telling us every day, is we’re hitting planetary boundaries. Whether it’s human-induced climate change or ocean acidification or change in the nitrogen cycle or freshwater scarcity or massive industrial pollutants or destroying habitat and losing biodiversity, this juggernaut of a world economy is pressing against the finite limits of the planet so strongly that we’re endangering millions of species, including the human one. And this is something that is new for us because humanity and our world economy was never so big, so demanding in using resources that we would actually threaten a global-scale environmental crisis. But the momentum of the world economy is so strong, the interests are so strong, the way companies behave so powerful that changing course and doing it in a cooperative way that still allows developing countries to continue to grow rapidly and find their space, but at a global scale, while living respectfully within the planetary boundaries, this is something new for humanity. It’s feasible; it requires a course change; it requires the adoption of new sustainable technologies; it requires the best intellects around the world to help solve problems and design new, more sustainable systems. It’s within reach. It’s a hard problem. It’s our generation’s problem. It’s the core purpose of adopting sustainable development goals. 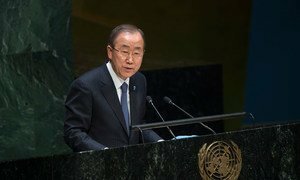 Secretary-General Ban Ki-moon looked forward to a “year of opportunity,” as he briefed the 193-Member United Nations General Assembly on his priorities for 2015, and called for transformative global action that would ensure sustainable development and human dignity for all.